With me none too confident about my future with the M14 rifle, Platoon 373 moved on to live firing the second week in November. At the beginning, I did no better with live ammunition than I had snapping in. For the first couple of days, I even managed to fire on the wrong target. I could see the target just fine. It just happened to be someone else’s. The targets at Camp Matthews were large – perhaps 6 feet by 6 feet. Half the platoon took its turn firing at targets, while the other half raised and lowered them between rounds. The pit crews hauled the targets up and down and looked at the holes. If the rifleman hit the bull’s-eye, we waved a white flag to let him know. A signal I do not recall directed those of us in the butts to haul up fresh targets. The butts consisted of two tall earthen berms built for protection from the large-caliber bullets. The first berm was built up 10 or 12 feet in front of the target to provide walking space for the butts crew. The second berm was built up behind the targets to stop the rounds from travelling off the base. The Marine Corps was serious in the extreme about weapons safety. No one drew ammunition until immediately before firing. Never did recruits place a a finger inside the trigger guard unless firing downrange. No recruit dared point the muzzle of his weapon in any direction other than down range. I’m sure these rules applied to everyone, not just recruits: Marines qualify with their weapons each year. To someone schooled at a Marine rifle range, it is inconceivable that civilians can now sign up for a day’s course in operating a pistol and then carry around a loaded weapon. We never carried live ammunition except on the firing line. We fired the famous 45, the 45-caliber service revolver, M1911A1, for familiarization, but did not qualify with it. The Marine Corps did not issue pistols to infantrymen. We fired other weapons for familiarization, including my favorite, the Browning Automatic Rifle.. The BAR let out a deep, satisfying boom-boom-boom as it cranked through its ammunition belt. This large 20-pound submachine gun, with bipod legs and belts of ammunition, had been the automatic weapon in an infantry squad until the 1960s. But the M14, which had the capacity to serve as an automatic rifle, was replacing it. 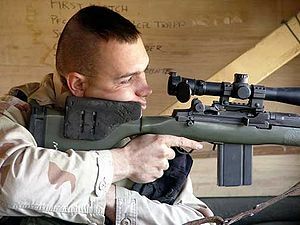 The M14 remains in use as a sniper weapon. To qualify with the M14, you had to score at least 190 points of 250 possible points. This earned you the marksman’s badge. If you scored at least 210 points, you earned sharpshooter. But if you fired 220 points or above, you qualified as a rifle expert. Expert required you to shoot at least 44 bull’s-eyes. A perfect score would have been 50 bull’s-eyes. Marksman was my goal. I just wanted to graduate. Each stage of shooting was worth 50 points. There were five stages for a grand total of 250 points. You earned 5 points for each bulls-eye, 4 points for the first outside ring, 3 for the second, and so on. If you missed the target – which I was now doing – the crew waved a pole in front of the target with a large red disk on it. This replaced the infamous red flag known as Maggie’s drawers, based on an obscene poem of World War I. You fired at targets from three different positions: 200 yards, 300 yards, and 500 yards. At the 200-yard line, you shot twice from the standing position. One time was slow fire (i.e., one shot at a time) and the next rapid fire (to blaze away with a 10-shot magazine). Although the sling bound your left arm in the standing position, the muzzle of the rifle seemed to wave like the ocean when the target came up. At 300 yards, I recall choosing between the kneeling and sitting positions. But it may be we shot rapid-fire kneeling and slow-fire sitting. Finally, at 500 yards we fired only slow fire, 10 rounds from the prone position. 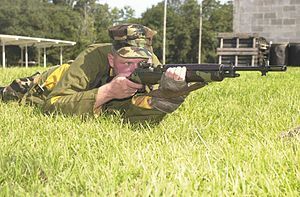 I liked the prone position. I was gradually learning how to squeeze the trigger. One DI – I believe it was Corporal W. E. Eastman – told me to sink my right cheek on top of my right thumb as I gripped the top of the stock. He showed me to take aim and then draw a deep breath, let the breath out part way, and pull the trigger back so slowly that the explosion of the cartridge took me by surprise. Then I allowed the recoil of the rifle to rock me back slightly before I sank back into position. By the end of the week, I hit my own target all the time. I even shot a few bull’s-eyes. I thought I could qualify in the third week. Bill, This is really interesting. I never knew how wide the berms were, the actual procedures on the range, nor the hours that went into training a Marine rifleman. I was intrigued by your statement that what it takes to be considered proficient and safe in the use of a civilian handgun in the modern era would be deemed woefully inadequate by any Marine. I am not trying to represent the views of Marines, just observing that I took away from the range the idea that you don’t brandish loaded weapons. And I have never taken a concealed-weapons course. It does surprise me how few reports of accidents I read. I am not commenting on the problem of weapons in the hands of the mentally ill, which seems to cause the mass murders now terrifying society.